Students discuss the importance of senses and experiment using echolocation as an example. If time is limited, make a group map in Step 1. The bat and insect echolocation game may be done with multiple players at the same time if space allows and the students are compliant to the rules. It can also be done as a demonstration using student volunteers if space or time is limited. 1. Students compare human senses to robot sensors. Tell students that animals, including humans, use their senses to collect data from the environment. This collected data is used to help make decisions; for example, if you touch a hot stove, you will pull your hand away, or if you see that the street is clear of cars, you know it is okay to cross the street. These senses are important because they provide important feedback about the environment. Have the class participate in naming the different senses humans use; sight, hearing, touch, taste, and smell. Have students share ideas on how humans collect data from the environment using these five senses. Ask: What do these senses tell you about your environment? Elicit answers from students that reflect decision-making. For example, touch can tell you if something is too hot or too cold. Hearing can tell you the type of environment you’re in. Sight can tell you how far away obstacles might be. Introduce students to the idea that robots also use senses, in the form of sensors, to collect information from the environment. Ask: Why do robots need sensors? Explain that robots need sensors to make decisions about tasks, like how to move or where to go next. Just like a student needs to wait until there is no traffic to cross the street, a robot needs to have an understanding about its surroundings. Ask: How do humans use their senses to make observations about their surroundings? Answers should include seeing what’s around them, hearing noises that give them clues to what’s nearby, and feeling items that might be near them. Ask students to each draw a map of the classroom or room they are in. Give them a few minutes to make their maps. After students have finished making their maps, ask: What senses did you use to make your maps? Most students will have relied heavily on their sense of sight. Ask: If you could not see, what other senses could you use? Explain that some robots make maps of their environment using their various senses. 2. Introduce LIDAR as an example of a robot sensor and compare it to echolocation. Explain that unlike humans or animals, robots do not have naturally occurring senses. Engineers must create them, as sensors, for robots. Robots need to use sensors to create a picture of whatever environment they are in. An example of a sensor used in some robots is called LIDAR (Light Detection And Ranging). LIDAR is a technology that uses a laser to measure distance. Lasers illuminate objects in an environment and reflect the light back. The robot analyzes these reflections to create a map of its environment. LIDAR tells robots what is around them and where it is located. 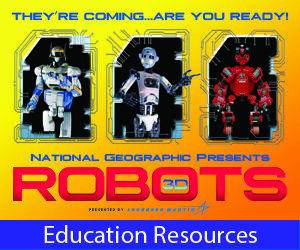 Tell students they are going to watch a video clip of a robot using LIDAR. Before playing the video clip, ask students to keep the following question in mind: Why does Chimp need to use sensors? How does Chimp sense its environment? Play the clip, and then repeat the questions, eliciting student responses. Explain that Chimp’s LIDAR can be compared to echolocation, a hearing sense that occurs naturally in some animals. Explain that sometimes scientists purposefully use nature as inspiration for creating technology. This is called biomimicry. Remind students of the senses they used to create a map of what was around them in the first step. Explain that some animals use sound waves to determine the location of objects. This is called echolocation. Show the provided diagram of echolocation. Explain that when animals use echolocation, they make sounds that reflect off surfaces and return to their ears. This information is then interpreted by the animal so it can understand its environment and what action to take next. Compare echolocation to hearing an echo, an experience many students will be familiar with. When a loud sound travels a large distance and hits a reflective surface, some of the sound waves may bounce back in a way that a person can hear. Ask: What are some animals that use echolocation? (Answers may include bats and toothed whales, like dolphins). 3. Students play a bat and insect game to experience echolocation. Tell students they are going to participate in a game to experience what it is like to use sound rather than sight to locate objects. One student will play the role of a bat and another will play the role of an insect. The bat’s job is to locate his or her dinner, the insect, using sound. In a space with plenty of room, mark off a 6 x 6 m (19 x 19 ft) square using masking tape. This is the field of play. The insect may not leave the square during play. When the insect is in the square, the bat is blindfolded and led to the square. The game begins with the bat calling out, “Dinner!” To which the insect must respond, “Not me!” each time. For example, if the bat says, “Dinner, dinner, dinner,” the insect must respond, “Not me, not me, not me,” quickly. This continues until the bat locates the insect and places one hand gently on the insect, indicating that dinner is served. Remind students there is no running. 4. Have a concluding discussion about sensors. Ask: In the game, how did the “bats” know where to find the “insects”? Are there differences in the way bats and robots use senses to gain a better understanding of their environments? Explain that bats instinctively know how to echolocate and can learn from their experiences; however, robots must be provided with an artificial sensor and then be given specific instructions on how to use it in every possible scenario. Explain that improved sets of guidelines or rules to follow to accomplish a task, or algorithms, for robots and better sensory information help robots create better 3-D maps of their environments. The images coming from a camera, like the Microsoft Kinect (Yes! The same sensor you use when you are playing video games on the Xbox), are stitched together to form a collage, or one big picture. One way to think about this is that it’s like the robots are taking a panoramic picture. If robots have better sensory information, it can improve their navigation abilities. This means that if robots have better sensors, they can have a better idea of where, or where not, to move. For example, imagine your vision is blurry. You may not see the tree in front of you and run into it. If you wear glasses to improve your vision, then you’ll see the tree and avoid hitting it. You can think of the tree as a robot’s sensory information, and the glasses as the better sensors. Remind students that biomimicry is the practice of using nature and animals, which have honed their adaptations for millions of years, as inspiration for solving engineering problems. Have students articulate how biomimicry could be applied in the development of robotic sensors. This activity may be done as a demonstration using student volunteers; if time and space permit, groups of students may participate simultaneously. Explain that some humans use echolocation for simple environment mapping and navigating. Show the Brain Games: Echolocation video and/or have students read Science: How Blind People Use Batlike Sonar, and then explain that students are going to create their own echolocation model. Have a student sit blindfolded at one end of a room with a noise-making item. Have a second student hold a large, flat object and walk back and forth in a perpendicular straight line approximately 24 cm (9 in) in front of the seated student. The flat side of the object should face the seated student. Instruct the seated, blindfolded student to use the noisemaker repeatedly and listen for subtle differences in the manner in which the sounds reflect back to his or her ears. When the seated student believes the object is directly in front of him or her, the student will signal by waving his or her arms. As a class, discuss the results of the exploration. The flat item, when in front of the seated student, will reflect some of the sound back toward the student and a difference in sound may be detected. Structure, Function, and Information Processing: 4-LS1-2. Use a model to describe that animals receive different types of information through their senses, process the information in their brain, and respond to the information in different ways. Structure, Function, and Information Processing: 4-LS1-1. Construct an argument that plants and animals have internal and external structures that function to support survival, growth, behavior, and reproduction. Structure, Function, and Information Processing: 1-LS-1. Use materials to design a solution to a human problem by mimicking how plants and/or animals use their external parts to help them survive, grow, and meet their needs. Waves and their Applications in Technology for Information Transfer: 1-PS4-4. Use tools and materials to design and build a device that uses light or sound to solve the problem of communicating over a distance. Clear a large enough area in the classroom of obstacles to prevent accidents. Mark off a 6 x 6 m (19 x 19) square using masking tape. A smaller space can be used if that much free space is unavailable. Animals, including humans, use sensors to gather information pertaining to their environments. The five most basic senses humans use to collect information are sight, hearing, touch, taste, and smell. Robots also have senses in the form of sensors. Sensors are used to evaluate the environment in which the robot is operating and allows the robot to adjust actions based on collected data. Scientists and engineers have developed many kinds of sensors. When engineers use nature for inspiration in developing ideas for these sensors, it is called biomimicry. Echolocation is a sense that uses sound waves and echoes to determine where objects are in space. Bats use echolocation to navigate and locate food in the dark. Most bats send out sound waves from their mouth and/or nose. When these sound waves hit an object, they produce echoes. These echoes return to the bat’s ears and aid the bat in determining where an object is, how big it is, and its shape. Robots using LIDAR use laser beams in a similar way to how bats use sound. The robot uses a beam of light that is reflected back to it to determine the distance to an object. The robot then plugs this information into an algorithm, with which it has been programmed, to map the space and the objects in it, and determine its next action. There are many other areas where animals and nature have inspired product innovation, such as swimsuits that attempt to reduce drag for competition swimmers by mimicking a shark skin, and the ever famous inspiration for Velcro, the common burr that gets stuck on your clothing after a hike. process of using models, systems, and elements of nature as a guide for developing new technology. ability used by some animals to emit high-pitched sounds and determine an object's distance by the time it takes for those sounds to echo. faculties of sight, smell, hearing, taste, and touch. instrument that receives a signal and transmits data about that signal, such as data on light or heat.